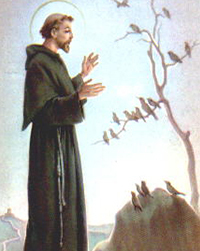 St. Francis has brown skin. He walks with a stick. He’s got big eyes, thick brows, long nose, small mouth, medium sized ears, smiling. Each side of his arms, on his head and in front of his feet he has animals. He can barely walk through all the animals. Around his right shoulder there’s a rope and therefore his clothing, which is long brown with yellow and white in it, has only a left sleeve. His hair is brown. His arms are long and his hands are big. He is 1.85m high. His eyes are brown. His eyelashes are also long. One day I went to a prayer session to buy rosaries and scapulars and a woman handed me a paper of the novena of St. Therese. When I got home I prayed. I complied with what the paper told me to do, pray the novena for 5 days. After the 5 days, I couldn’t imagine how many miracles happened to me. The miracles can be called gifts. My uncle brought a rose air freshener for me, while he didn’t know why. When I got in my car I switched it on, there was one song on the radio saying “you are my rose”. When I got back home, I got a visit from 2 people from St. Maarten – they brought me two gifts. After they asked me to open it, I saw I got 2 glass gifts which had roses in them: two hands and between them a rose and one book with a rose inside. The scent of roses filled my room. 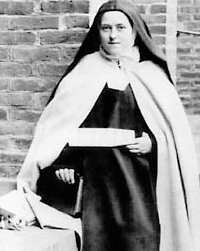 When the visitors left, St. Therese appeared to me and told me “Let everybody pray my prayer and love me from their hearts, because I am also a Saint that will comply with what God sends me to do. All my roses will keep on blooming on this world. All will receive my gift”. St. Therese is a very beautiful Saint. 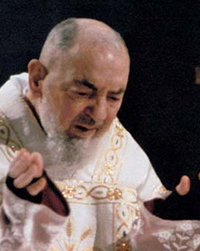 Padre Pio of Pietrelcina, a beloved Saint, first came one day some years ago, when the Visionary was asked by our Lord to perform the consecration of all present to the Sacred Heart of Jesus and the Immaculate of Mary. During that very special evening our Visionary saw different saints from afar and only a few came closer. Padre Pio didn’t come very close that day, but he asked the Visionary to please introduce his devotion and print books about him, because he was going to offer many miracles. At this time his devotion wasn’t as yet present at Koyari. His devotion was initiated the same year. The second time Padre Pio came, he appeared together with the Virgin of Grace of Arub a on Her apparition of the 25th of March 2014, when it was the Visionary’s 40th birthday. He was eager to speak and very strict. St. Rita of Cascia was also present on this remarkable apparition day. Read the message of the Virgin Mary of the 25th of March 2014 here that includes the message of St. Pio. 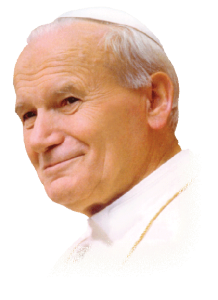 St. John Paul II, another beloved Saint, came also on that special day of the consecration of all present to the Sacred Heart of Jesus and the Immaculate of Mary. He didn’t speak. 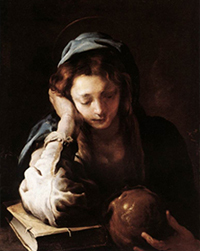 St. Mary Magdalene, a saint of whom her devotion was already present in our activities, came forward and walked closer to the women who were engaged assisting the Visionary with the consecration. She didn’t speak, but touched some of us in our hair, and our shoulders. St. Rita of Cascia, one of the most beautiful and beloved saint of Koyari, appeared together with the Virgin of Grace of Aruba with Padre Pio of Pietrelcina on the 25th of March 2014 – the birthday of our Visionary. She’s very beautiful and had long hair. 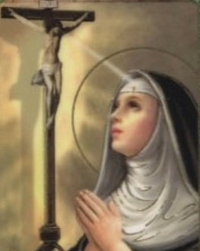 Read the message of the Virgin Mary of 25th of March 2014 here that includes the message of St. Rita of Cascia. On the 25th of December 2014, the Virgin of Grace of Aruba appeared with St. Joseph and the Child Jesus in the Chapel, as the image of the Holy Family is also present in the Chapel. The Visionary said that the Virgin Mary asked to pray to St. Joseph always, as he’s always protected Her. 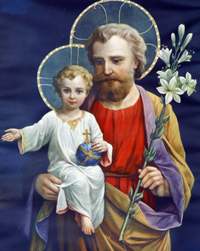 From now on, all our Saturday prayers include prayers to St. Joseph. Read the message of the Virgin Mary of December 25th 2014 here. Jesus has permitted me to see Angels. I see the Angels of Koyari frequently, almost every day; either I go to Koyari and I see them and talk to them, or they come to me. Every experience with an Angel is very special to talk about. I’ve had the honor of seeing St. Michael Archangel and St. Raphael, two of the most powerful Angels of the world during an apparition with their Master at Koyari. The Angels came together with Jesus. While Jesus spoke to me, the Angels were going around the terrain. I am glad that Jesus gives strength to the terrain where many people will come to get their health, change of life and feel loved. During a significant day of the marking of the Cross of Salvation, the 25th of March 2002 (initially this was to be the last day, but the Lord’s Mercy for us is so immense, that he extended the time for the marking of the Cross of Salvation) the 4 most powerful Angels would stand at the 4 corners of the world and many other Angels lower in rank – lower because the other ones have heavier jobs to perform – were present until 4am on Koyari. You have to happy that Jesus has again prepared the world to see who will stay and who will go to Him. The Cross is a symbol of His pain for us. Remember that the Angels surround Jesus so that the world can receive Him, because the world has hunger and thirst to learn more of His word, where only goodness is found. Hurry to change your life before it is too late. On December 21st 2012, in 3-days of penitence and sacrifice for mercy for those who would commit sins in the bad times to come, after staying solemn since the early morning hours, a large group of the faithful came together in prayer, dressed in white. At 10.30am we came together in the middle of the terrain for prayers with all our love and dedication. We read a Psalm, the Holy Gospel of our Lord Jesus Christ, we prayed a Holy Rosary and sang together the Chaplet of Divine Mercy in song. 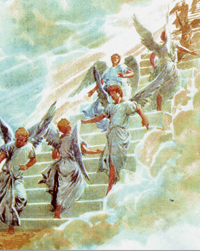 At 12pm, while singing the Chaplet of Divine Mercy, the clouds in sky changed and our Visionary saw 50 Angels from the Throne descending slowly in a V-formation. From the 50 Angels, 2 spoke to her saying that she should gather everyone, put all people together to stand up and prepare for our Lord who was coming to be amidst us all. This was the first time that Jesus appeared to her with more people present. The other Angel told her that we should have more trust in our own lives. These 2 Angels left and she only saw them back when Jesus was descending. 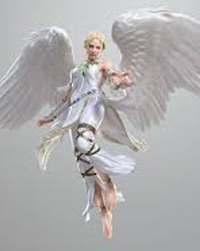 Many Archangels descended to stay around Jesus that day, also Archangels Michael, Gabriel and Raphael. 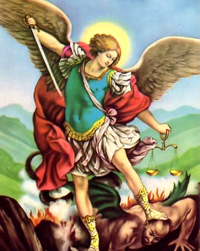 St. Michael told us to offer our hearts entirely to Jesus and pray the prayer of St. Michael Archangel 7 times. He also said to move away from sadness and evil. Archangel Raphael offered each of us present a cross of healing on our foreheads and for our souls to be clean and pure, for when enter the Celestial Glory someday, we can enter peacefully. Archangel spoke, only after the Creator descended at 3pm and spoke, and told us that those who want to serve heart of the Master should have a beautiful heart themselves. Their hearts should be filled with light to show others all the power the Master has to give you His light. Another Archangel, said to take a good look at which path we should take in our lives. He offered us gifts of knowledge and gifts to proclaim the Living Word of the Master, God. This was an experience most of us will never forget. The Virgin Mary in her apparition of December 25th 2014, Christmas evening, told our Visionary about this surprise – the Archangels Michael, Gabriel and Raphael would visit Koyari, to give Koyari more strength. On the 27th of December 2014 during our last Saturday prayer session of 2014, in front of the manger with the Child Jesus, Mary, Joseph, sheep and the Magi, we prepared to pray the Holy Rosary of Light; We offered a Rosary for the World as a plead for mercy. 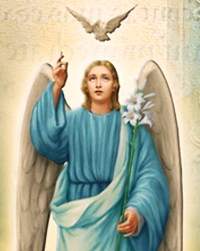 The Archangels, St. Michael, St. Gabriel and St. Raphael announced their arrival in the world to the Angels of Koyari. They didn’t come immediately to Koyari, but they went around the island and the world first. When they were to arrive at Koyari, the Visionary was told by the Angels of Koyari that They were at our main entrance door by the street and that they announced their presence. We kept praying the Rosary and they entered through the entrance arch of the terrain. They flew to the Chapel first to pay their utmost respect and adoration to the presence of the Holy Family – all the Angels of Koyari respectfully followed them into the Chapel. After some minutes the Archangels left the Chapel and they flew right in the middle of the circle in which we were sitting praying the Holy Rosary. Every person represented a bead on the Rosary, therefore every person was to pray the prayer represented. In the middle of the circle there was a large candle we lit for the world. The Archangels stayed for about 5 minutes with us, asking us to show humility by kneeling and offering all our petitions, worries, pain and suffering to them. We were offered the opportunity to ask for 20 things, they could be for ourselves, our family and our friends. Then St. Michael Archangel granted us 5 more. Prior to leaving they offered us some of their light and requested us to stretch our arms forward with the palm of our hands towards them and they would offer the gift of their divine light through their energy and light. Than they thanked us for accepting their presence and they announced their departure. Again, they flew out of our small entrance, than out of the main entrance. It was an incredible experience.